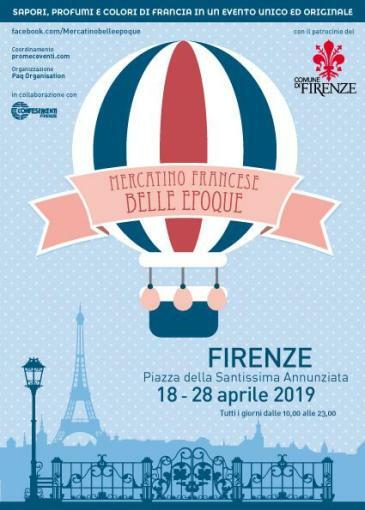 A unique and original event returns to Florence, in Piazza della Santissima Annunziata: the Belle Époque French Market. There will be both food and non-food products, all expression of different French regions. Those related to food and wine represent the heart of the village. Over 80 types of cheese, from the Mont d'Or, with the typical wooden package, to the Rocamadour of the Midi Pyrénées, from the Camembert of Normandy, to the Brie of the Ile de France. Even the wines are presented in over 30 variations, from Champagne to Bordeaux to Cider. The cured meats have particular types of production that combine spices and aromatic herbs. The Breton biscuits offer can count on over 20 different varieties of filling: from coconut to sesame, from chocolate to lemon. A large palette of colors is represented by the spice stand, which comes, in most cases, from the former French colonies. At the end of the food and wine area, one could not miss the hot, freshly baked baguette. The boilers of Boulangerie also prepare croissants and baked pastries. Craft products come from Provence and the French Riviera: tablecloths, soaps, lavender, essences and Provencal objects. Perfumes and a wide range of fashion accessories come from Paris. All products are carefully selected to guarantee the highest quality standards. The wide range of food offers can count on a chain of small producers, while the part concerning the Provencal and Cote d'Azur production, both of tablecloths, of soaps and lavender, come from artisan companies that are present within the event . In this proposal linked to France, we could not miss a corner dedicated to its regional gastronomy. Different depending on the characteristics linked to the territories, the presence of coasts or mountains, bordering with other European countries or influenced by traditions that are lost over time, the kitchen is declined in numerous proposals: tartiflette, cassoulet, chocroute and much more. A space is dedicated to wine tasting and, just to complete this completely French panorama, you can taste oysters and champagne.